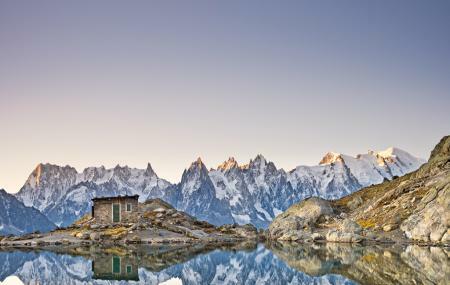 Lac (Lake) Blanc is a beautiful and serene lake in the Mont Blanc massif. The lake is situated at the height of 2352m. It is a great place to enjoy the view of the Mont Blanc. From the Chamonix town centre, it takes a hike of about 4 hours. From the Flegere / Index lift, it takes about 2 hours to hike up to the lake. You will find facilities and refreshments at the lake. Great place to have a picnic! Snacks and refreshments available near the lake. How popular is Lac Blanc? People normally club together Musee Des Cristaux and Mazot-musee while planning their visit to Lac Blanc. People also prefer to end their day with Lac Blanc. Absolutely stunning. I gave a detailed review of our trek up in a review of one of the other lakes up there, chemayul but just a warning, it is actually quite a hard trek and when you hear there are ladders there, think a ladder bolted to a cliff face about 20 metres long across a sheer drop, see pics. Cafe at the top was closed when i went for off season. Wonderful sight... one of the most beautiful places in Europe. Amazing view. For us, it is the most beautiful place in Chamonix. I suggest coming here from Index (some snow in summer), leaving here to Flégère.